Based on reviews from 19,282 users. Learn how our rankings work or see our guide to Etnies sneakers. Updated Apr 2019. As the first sneaker brand to be owned by a skater, it is no surprise that Etnies shoes spell everything about the skate culture. From its style, performance, and everything in between, the brand pioneered in releasing the first skateboard model and stayed true to its vision of being the top sneaker company for skateboarding. Though we are well-aware that Etnies is an American brand, many are surprised to know that it came from a French heritage when it was launched in 1986. It was only three years after when retired freestyle pro skater Pierre Andre Senizergue acquired the company and introduced it to the US market. It made Etnies a conglomerate of Sole Technology, along with Senizergue's three other brands eS, ThirtyTwo, and Emerica. While it draws profoundly from its roots, Etnies eventually diversified into other products and sports like motocross, surfing, snowboarding, and BMX. Moreover, because of the versatility of its footwear designs, the brand later transcended as a street-style favorite. The main attractions of these sneakers are its strength and style. The injected rubber toe cap enhances the durability of the shoe. These sneakers are ensured to have long-lasting life and comfort because of its technologies like the STI Evolution Foam midsole and 400 NBS rubber outsole. It is the vulcanized rendition of the popular Jameson 2 Eco. These Etnies classic shoes grip surfaces at a maximum as it is infused with RCT tread pattern, a favorite among many. The Jameson Vulc sports a lower toe box wherein the vamp is closer to the feet, which results to a better board feel. The Fader bears the tagline "inspired by our past, built for the future." Comfort is a priority as these Etnies classic shoes are clad with an egg crate construction midsole for extra cushion. The padded tongue and collar yields more protection and comfort. The footbed of these sneakers is infused with STI Foam Lite Level 2 for extra comfort and protection. Taking it a notch higher, it is inserted with a System G2 for additional cushion. Its outsole comes with a herringbone pattern to ensure traction. The outsole is bathed with deep multi-directional flex grooves that are strategically placed on the forefoot. The sidewalls of the outsole sports the classic double Strobel stitching to handle the wear and tear of the shoe. These Etnies sneakers have a ThermoPlastic Rubber (TPR) toe cap for protection, comfort, and durability. Also available in men's sizes, these Etnies sneakers lets its users experience the thrill of adventure with its breathable upper and comfortable midsole. These sneakers are infused with exposed STI Evolution Foam midsole for guaranteed comfort throughout the day. The STI Evolution works in combination with Foam 1 Lite midsole to boost its comfort further. There are vegan Scout options available that use water-based adhesives and synthetic materials. It has a vulcanized gum rubber construction for superior durability and flexibility. This shoe is part of the brand's "Buy a Shoe, Plant a Tree" program which was started by Andre last 2011. 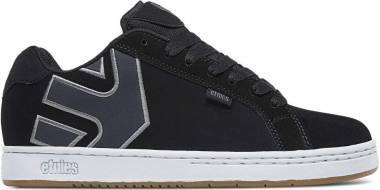 The slimmer Corby last sets these Etnies sneakers from the men's. Perforations on the medial side allow extra breathability. It is injected with Foam Lite 1 in combination with the egg crate constructed midsole for enhanced comfort. While the exterior captivates the attention of most purchasers, how it wears leaves a more significant impression. As part of the Sole Technology umbrella, Etnies has its venue, called the STI lab, which conducts biochemical researches and product testing to formulate advancements to prevent injuries and enhance users' performance. The STI Evolution Foam has a much denser makeup compared to the traditional midsole used on sneakers such as rubber, PU, and EVA. This comes in handy for skaters as this technology is able handle the wear and tear and the extreme movements of the sport. Instead of cutting the material, it goes through a molding process which reduces production waste. Made up of a foam polyurethane footbed, the Pro Foam 1 works remarkably well with the STI Evolution Foam. The match made in heaven combination results into excellent support and shock absorption. Technically not a tech, NBS connotes to a rating system for rubber wear regarding abrasion resistance and density. Four hundred is an ideal value of rubber to achieve flexibility without brittleness. As a result, Etnies sneakers with 400 NBS can enjoy reliable flexibility and maximum resistance. Utilizing their laboratory, Etnies comes up with its first skate-specific tech to handle all the movements and demands of the sport. The System G2 is a result of the biomechanical research which effected into extreme impact and shock absorption without sacrificing the feel of the board. While most of the sneaker collaborations involve only the exterior, Etnies takes it a step further by partnering with the almost 130-year old tire manufacturer, Michelin. Bearing in mind the simple correlation that tires are for cars and outsoles are for shoes, the brand thought that sharing technologies might as well share advancements that are proven to work. Pushing its thrasher vibe to another level is this collaborative piece with Metal Mulisha. The American lifestyle clothing brand puts a new spin on the best-selling Etnies classic shoes, Fader. The side walls of the sneaker get clad with either a Metal Mulisha logo or artwork. Four colorways are available for this version. These Etnies sneakers hold a 300 NBS outsole and STI Foam Lite Level 1 footbed for maximum comfort. 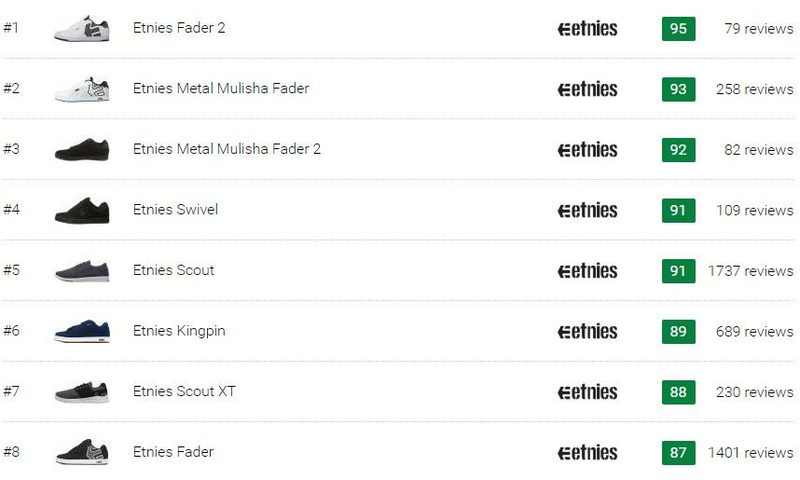 An updated version, the Metal Mulisha Fader 2, was released. It has more padding to provide additional comfort and protection to the feet. 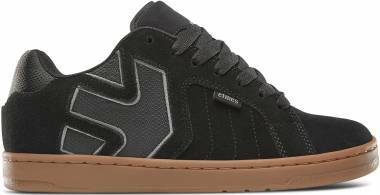 Sports action footwear and apparel retailer and manufacturer, 32, teams up with Etnies in coming up with a winterized version of some of its classic silhouettes. Updating the Jameson HTW, this piece gets stylized to adapt to the harsh elements of winter entirely. The upper of the shoe is microfleece insulated and is lined with a quick-drying material. The outsole is made of pure gum rubber outsole that has a low freezing rate. The Jameson HTW x 32 has a reverse-lugged outsole to induce more traction. Paying tribute to California's best-kept skater secret is the release of Joslin, named after legendary skateboarder Chris Joslin. Though sporting a straightforward design, these Etnies sneakers are packed with features to equip its users for aggressive wear. Its outsole is composed of Michelin performance rubber outsole for guaranteed durability. It has a hidden toe cap which extends in the ollie area. The Joslin has elastic tongue straps to have a better fit. One of the most current and most technologically advanced releases from the brand, the Marana XT Sheckler delivers the new definition of durability. Though infused with Etnies advancements like STI Evolution foam, Foam Lite 1, and 400 NBS, certain tweaks were made for these Etnies sneakers as an update. It is constructed with a strong PU flow-molded cap which sets its durability to the maximum without the compromise of board feel and performance. The medial sides have perforations to reiterate the breathability of the shoe. Where can I buy Etnies sneakers? While there are brick and mortar shops that carry the brand across the United States and the rest of the world, those who are interested in purchasing Etnies shoes can also utilize the convenience of online stores. Besides the brand website, it is also available at zumiez.com, tactics.com, zappos.com, among others. Are there ways to prevent the wear and tear of my new kicks? When cleaning your Etnies sneakers, avoid using harsh ingredients like alcohol and acetone. These can damage the waterproofing elements and adhesives and can also lead to discoloration. Air out your shoe or give it a break after intense wear. It allows your Etnies sneakers to extend its shape stability. A waterproofing spray, albeit not a must, is an excellent care product, especially for wet conditions. It prevents the holes from getting larger and the upper from changing shape. Placing your Etnies sneakers on the washing machine puts it on a risk. While this may work for others, this can damage the soles, padding, and adhesives and can lead to deformation of the shoe. What is the price range of Etnies shoes? Generally speaking, the price range of Etnies shoes are somewhat comparable to its rivals like DC, Vans and Converse CONS. Collaborative pieces, which typically are priced the highest, are priced $150, which is still reasonable in the sneaker market. The most affordable models of the brand are priced at $50, which is relatively affordable given that these models are still infused with Etnies technologies. Aside from sneakers, what are the other product offerings of the brand? Etnies offers a vast selection of products beyond sneakers. Its apparel line ranges from shirts, jackets, shorts, and pants and comes in a great mix of quirky and straightforward designs. The accessories, on the other hand, come in a remarkably varied selection, from towels, skate bags, socks, and belts. Where can I score cheap Etnies shoes? Those who desire some serious bargain hunting need not break an arm and leg. Brick and mortar stores usually conduct sales, but users who would like to purchase through the convenience of their phones or computers may do so through the brand's website. Just look for the sale option tab to see the selection of products. What is the style of Etnies? Because of its roots, one could easily tell this on the aesthetics of the shoe. Because its skateboarding heritage greatly influences Etnies, you could easily spot this on the designs of its sneakers. Most of the kicks have a heavily padded tongue and collar, which is the typical silhouette of a skate shoe. There are also some that are donned with more streamlined and clean shapes which makes it easy to dress up and down or used on varying occasions. What are the ways to clean your Etnies shoes? For versions with leather and canvas upper, hand washing it may be the best option. A small amount of laundry detergent or dishwashing soap with water along with a brush can be used to clean the shoe. For white sneakers, using a baking soda can boost its whiteness and further clean the sneakers. For suede upper which has a more delicate material, a suede eraser solution which is available in most shoe stores can be used. Vinegar is also a good substitute for this. Allow the shoe to air dry after cleaning. Are their lifestyle kicks worth your money? 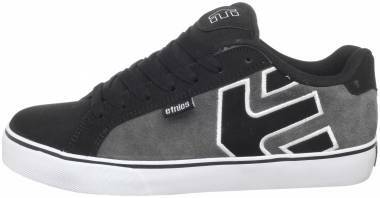 Because Etnies has already built its reputation in the skate arena, the quality of its shoes, even those for casual wear, leans towards these qualities. Comfort, durability, protection, performance, and style are some of the features that users love about this product. 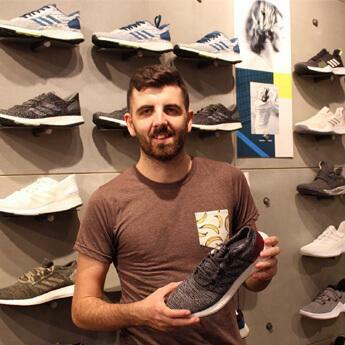 Because the brand has its laboratory to formulate and test its technologies, purchasers can be ensured that its sneakers are tried and tested. Are eS and Etnies the same brand? Many get confused if these are the same shoes or whether they are a different brand and these points are both valid given that both brands are under the Sole Technology umbrella. When Pierre Andre acquired the Etnies brand, he wanted to create something new, and eS served as a breakaway brand. The name eS comes from the first and last letter of Etnies. Are Etnies sneakers environmentally friendly? More than being a footwear brand, Etnies also makes its mark on its environmental initiatives. Aside from its programs like the Buy a Shoe, Plant a Tree program which won awards, the brand also produces vegan shoes that offer no harm on our planet. The brand also makes it easier for its users to spot its vegan line as it stamps a no-cow symbol on the shoe. Some of the colorways of the Etnies classic shoe like the Jameson, Scout, and Marana, have certain colorways that are vegan.